Stepping into the home turf of Chief Minister Siddaramaiah, Bharatiya Janata Party President Amit Shah told him that his “time” has come to an end and he would be mistaken if he thought that saffron ideology could be stalled by unleashing violence against BJP and RSS workers. Shah began his fourth round of visit to the poll-bound Karnataka with a tour of old Mysuru areas, and asserted that Siddaramaiah and JD(S) would receive the “biggest shock of their lives” from the region in the May 12 assembly polls. “It is said that the BJP is a bit weak here (Old Mysuru region), but after seeing the work of the party workers, I expect Siddaramaiah ji and the JD(S) to get the biggest shock of their lives from this Mysuru region,” he told a party convention here. The principal challenger to the ruling Congress is JD(S) in these districts. Continuing BJP's bid to reach out to the prominent Lingayat community, Shah began his fourth leg of the visit by meeting it's prominent pontiff at Suttur Mutt here. “Took blessings of Sri Shivarathri Deshikendra Mahaswamiji of Sri Suttur Math in Mysuru,” he tweeted after his meeting with the seer. The BJP president had begun his third leg of tour on March 26 by seeking blessings of 111-year-old Sri Shivakumara Swami of Siddhaganga Mutt in Tumakuru, a revered seer of the Lingayat community. The visit assumes significance as it comes in the backdrop of the Siddaramaiah government's move to recommend to the Centre to accord a religious minority tag to Lingayats and Veerashaiva Lingayats in an attempt to wean away a section of them from the BJP. Shah went on to say that Siddaramaiah cannot stop saffron ideology from spreading by unleashing violence against BJP and RSS workers. “In politics, there is no room for violence. If Siddaramaiah and his government think they can stall our ideology from spreading, then he is mistaken,” he said. “I would like to tell the people of the state that Siddaramaiah's time has come to an end. Soon after BJP forms the next government under Yeddyurappa's leadership, it will make all efforts to hunt down the killers (of RSS and BJP workers) from any corner of the world,” he said. Shah had met the family of BJP worker Raju, who was hacked to death in March 2016. Later, he referred to his gaffe at Davanagere earlier this week and said that though he had committed a mistake in his speech while referring to Siddaramaiah's corruption, people of the state would not do the same because they knew Siddaramaiah's rule well. “Siddaramaiah and Rahul Gandhi were very happy over my gaffe while speaking about Siddaramaiah's corruption. I had made a mistake, but the people of Karnataka will not make it, because they have understood his government very well,” he said. 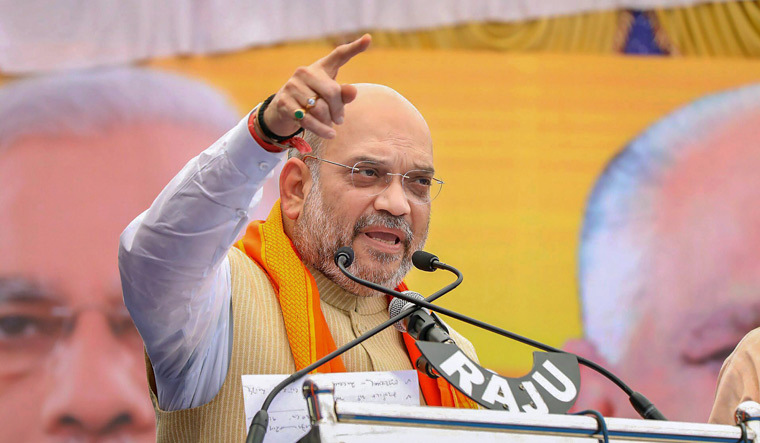 In a slip of the tongue at a press conference at Davanagere while attacking the Siddaramaiah dispensation as the “most corrupt” one, Shah had said that the Yeddyurappa government would get the number one award in corruption. Shah also accused Siddaramaiah of playing with Karnataka's pride by not celebrating the “jayanti” of noted Kannada poet Kuvempu or renowned engineer Sir M. Vishveswaraiah. “Siddaramaiah only remembers to celebrate the jayanti of Tipu Sultan (the 18th-century ruler of Mysore) to get votes,” he said. Shah met the Wadiyar royal family of Mysuru at their private palace, triggering speculations about their supporting or joining the BJP. According to sources, during the closed door meeting with the scion of royal family or the present titular Maharaja Yaduveer Krishnadatta Chamaraja Wadiyar and Rajamata Pramoda Devi Wadiyar, Shah reportedly discussed various issues, including politics. Amid speculations in the media, Yaduveer, the 27th “king” of the Wadiyar dynasty, recently ruled out his political entry. “I have told several times that I'm not interested in politics. There is no chance at all about me joining any party. I'm not interested in politics. Through social work, we will continue our relationship with the public,” he said.